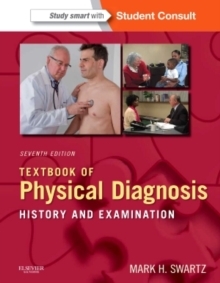 Derive the maximum diagnostic information from interviewing and examining patients with Textbook of Physical Diagnosis. Employing a compassionate, humanistic approach, Dr. Swartz explores how cultural differences can influence communication, diet, family relationships, and health practices and beliefs, and demonstrates that your interpersonal awareness is just as essential in physical diagnosis as your level of technical skill. This medical reference book features numerous high-quality color images, an easy-to-use design, and detailed descriptions of exam techniques, making it an essential guide for physicians, nurse practitioners, and physician assistants. Learn about special considerations related to patient's unique situations, such as cultural differences, nutritional status, and overall health, which may affect your approach to their treatment. Understand the causes of the symptoms you encounter with Pathophysiology explanations. Easily review illustrated components with abundant color photographs capturing the true appearance of various diseases. Access coverage of complementary and alternative medicine so you can be alerted to the clinical implications of these increasingly popular modalities. Provide the best medical care through the art of interviewing and physical examination with the most recent coverage of relevant physical diagnosis standards and tests, as well as detailed discussions of key exam techniques. Reference information on-the-go. Several chapters have been moved online, resulting in a more portable and concise print edition that focuses on core material. View examination techniques and clinical presentations more clearly than ever before with help from high-quality color images, over 900 photographs, and line art supplementing the detailed text. Stream more than 6 hours of in-depth video, review online-only chapters, and reference the entire contents online at Student Consult. Gain in-context access to online videos using your smartphone by scanning accompanying QR codes located throughout the text, covering step-by-step key aspects of the physical examination for adults, newborns, toddlers, as well as important interviewing scenarios.